Join Family Life International, EuroProLife, SPUC, Good Counsel Network, Helpers of God's Precious Infants and other ProLife groups in bringing attention to the grave plight of our unborn brothers and sisters. Since 1967, more than 7 million children have died at the hands of the death peddlers. Our British politicians continue to fund the killing of Britain's future generations at a rate of 200,000 per year that is One million children every 5 years. When Our Lord asks what did you do to protect my innocent little ones, you can confidently reply, “I called to the end of the killing of these innocent little ones was one of those activities. 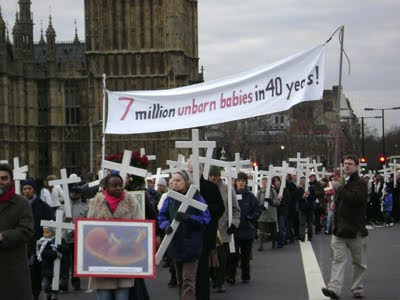 “500 Crosses for Life” is an initiative of European Voice of Unborn Children: Protect our Life (EuroProLife) Please join us so our voices can be heard pleading for the voiceless. Family Life International, Doing the most important work on earth.